For many people, the words “community service” conjures up visions of helping in a food pantry or clearing trash from the roadsides. While service of course, does include these kinds of invaluable activities, the David School believes it can be a multidimensional educational experience as well. 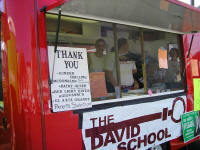 “Learning While Serving” has been the motto of The David School since the school’s inception. 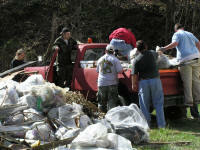 Community service has been part of the curriculum over the years. Some of the many service activities performed by our students have included working on campus beautification, construction, visiting nursing homes, assisting with projects for community elementary schools, blood drive as well as many other activities. Through the community service program, “Learning While Serving” our goal is to have the students grow personally, socially, and intellectually while at the same time teach them the importance of citizenship and the preparation for the world of work. Research shows that students retain 5% of what they hear; 10% of what they read; 30% of what is demonstrated; 50% of what is discussed in group setting and 75% of what they practice by doing. The “Learning while Serving” model places emphasis on the experiential and reflective components making the learning more meaningful and lasting. There are several activities that students can become involved with at The David School, including Soccer, Basketball, and the Student Council. 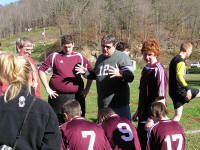 The David School Soccer Team is comprised of boys and girls who compete in the Floyd County Youth Soccer Association. The intramural team was established 5 years ago and is coached by teachers from The David School. 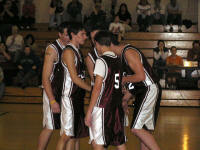 During the 2002-2003 school year, an intramural boys basketball team was formed. Coached by a parent volunteer and David School staff the team had a wonderful experience, learning about team play and sportsmanship. The basketball team continues to play today. Unfortunately, in the absence of a school gym, the team has to travel 16 miles to practice and must play all of its games on the road. Continuing the belief that all at The David School are equal, every player gets to play in games regardless of athletic prowess and all players are supportive of each other and respect the guideline. In spite of the obstacles, the Falcons still persevere season after season. 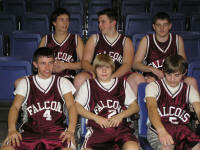 Recently students banded together to form the Falcon’s Spirit Squad. This dedicated group of fans attends games in their “Falcon’s” t-shirts and cheers their heart out for our players. Spirit Squad members have added an increased energy level at games they are able to attend. Student Council is made up of representatives that have been elected by the students from the various classes. A real voting booth is brought to the school and every student gets to participate in the election process. During the school year, this council leads the planning of various school activities such as fieldtrips, school dances, the ski trip and the Prom. 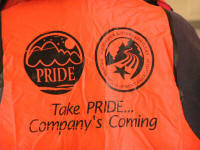 They are also responsible for the fund raising efforts throughout the year necessary to support such activities. Fundraisers vary from car washes to yard sales to candle sales to buy a pie to hit the teacher of your choice. 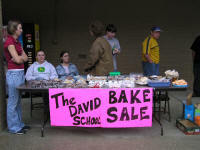 All David School students are encouraged to participate in the fundraiser events and the activities that result. This year the student council held a spirit week to raise funds for student activities. Activities for spirit week included a penny war, buy a pie to throw at a teacher of your choice, and theme dress days. For Valentine Day, students organized and sold "candygrams" and "flowergrams." "When I got to The David School I could hardly read. I was on a third grade reading level and now I am on a twelfth grade level." - From David School graduate John Garrett's speech at the January 2005 graduation ceremonies. "At one point in time before I came to The David School, I wanted to just quit. A high school diploma wasn’t important to me until I came here." - From David School graduate Brandy Justice's speech at the January 2005 graduation ceremonies. "The David School is different from other schools because they have smaller classes and a more relaxed learning environment. You get help on what you need to learn and the teacher’s trying to help the individual student." - From a David School student. "I never went to school. I skipped at least three days a week. The last 6-Weeks of my sophomore year I decided school wasn’t for me. I quit. That summer I met a student who explained the good points of the David School. I figured I’d give it a try and if I didn’t like it I’d quit. Here it is my second year here and I love it." - From a 2000 David School graduate. "The David School has not only given me confidence, it has put me on the right path towards my future. Before coming here, I had no plans for college and I wasn’t really sure I would make it through high school. Now I am looking forward to attending college and getting a job that I am sure will support me financially." - From David School student Jessica Hale, speaking to the Floyd County Chamber of Commerce. "The atmosphere of the school is what makes it unique. Everyone looks at everyone else as an equal. The school itself is beautiful and the campus too. It helps us relax and concentrate on our schoolwork. This school has more windows than any other I've seen. It feels more open and more welcome."